I don’t listen to a lot of audio books, but on occasion I will drive some long distances and during those times I like to listen to a book. I’m a little slow to the John Scalzi bandwagon, but I’ve been aware that he has quite a following. This is only my second Scalzi book (the first being Redshirts) but I am already hooked. Scalzi’s writing is very approachable and his story-telling smooth. He is able to create identifiable characters and his plots build nicely. 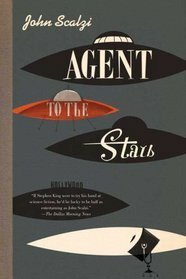 Agent to the Stars tells the story of a Hollywood talent agent who is assigned the client(s) of a lifetime — an alien race that is looking to find a way to introduce themselves to humankind. The alien race, while acting benevolent and kind, doesn’t have an appearance that would normally suggest such kindness, so the agent, while learning about the aliens, must find a way to safely introduce them to the world. As I mentioned, this was an audio book, read by Wil Wheaton. It took me by surprise, even knowing Wheaton was reading the book, when I first heard him and I couldn’t help but picture the smartass kid from the Star Trek: The Next Generation series. But it didn’t take me long to put that image aside and simply enjoy the book. Wheaton does a nice job, and although his character voices aren’t necessarily distinctly different (not everyone can be Jim Dale reading the Harry Potter series! ), his reading is very easy to listen to (I can’t the same for the book I started listening to after this, nor for the book I listened to prior to this — both with narrators that had voices difficult to listen to). All in all, this was a nice way to spend a long drive … listening to a very decent story. Looking for a good (audio) book? Agent to the Stars by John Scalzi and read by Wil Wheaton delights and surprises and should appeal to fans of light, humorous science fiction.